This entry was posted on March 17, 2008 at 11:16 am and is filed under Caregiver Truths, Caregiving, Caregiving Lessons. You can follow any responses to this entry through the RSS 2.0 feed. You can leave a response, or trackback from your own site. 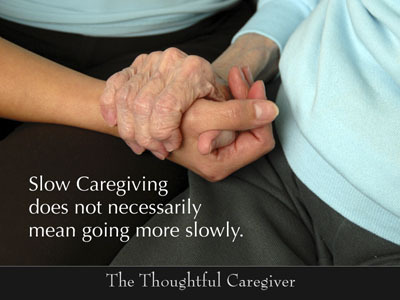 I agree with your premise about slow caregiving. I believe that any decisions must be made in the best interest of the care receiver. I found that in a family caregiving situation that too many times the decisions were not well thought out because the goal for those of us care for my aunt were thinking about how treatments might keep her with us instead of what would be best for her.